The IP address in the dialog box was not the address of my laptop, and if an important piece of information like that is faked then maybe the Microsoft toll-free phone number listed in the dialog was also faked. So I opened Task Manager and killed my web browser. 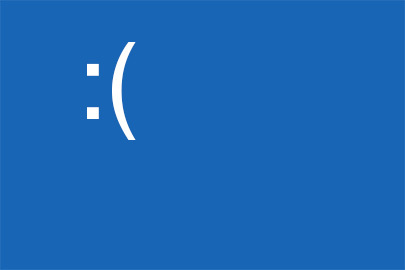 When I restarted my browser a dreaded blue-screen-of-death (BSOD) appeared with the above dialog displayed over it. That also clued me in that something was fishy because a BSOD screen can never have a dialog superimposed over it since Windows isn’t running at that point. It turned out I was another one of millions of PC users who has succumbed to a fake tech support scam. Microsoft’s Digital Crimes Unit has a YouTube video worth viewing that warns users about such scams. Fortunately, I quickly found this forum thread on Neowin that describes how to fix the fake BSOD and popup that kept appearing when I opened my browser. 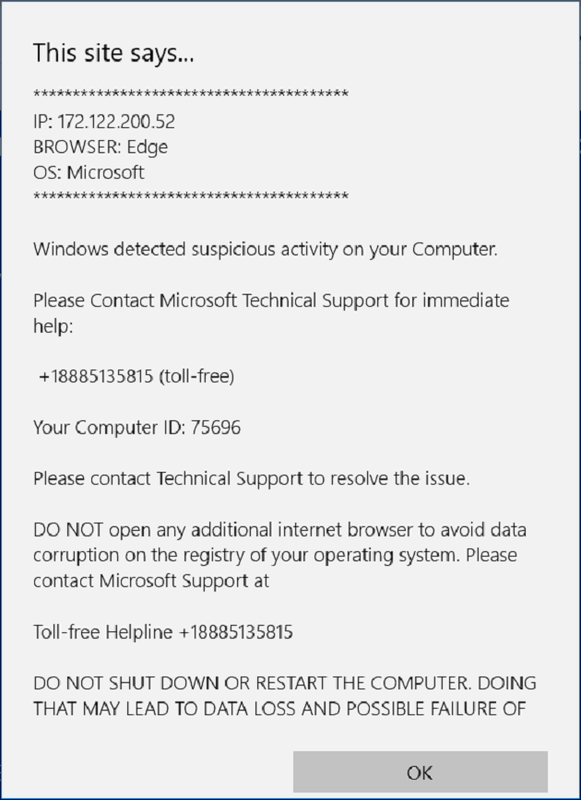 Fake tech support scams like this can be a drain of time and energy for helpdesk of your organization. The best way to prevent them is by user education. “The way we have encountered the screens are through articles on reputable sites,” says a colleague named Merlin who works in the IT department for a county office in New Jersey. “Someone will go to read an article that is linked to another site and there it is. 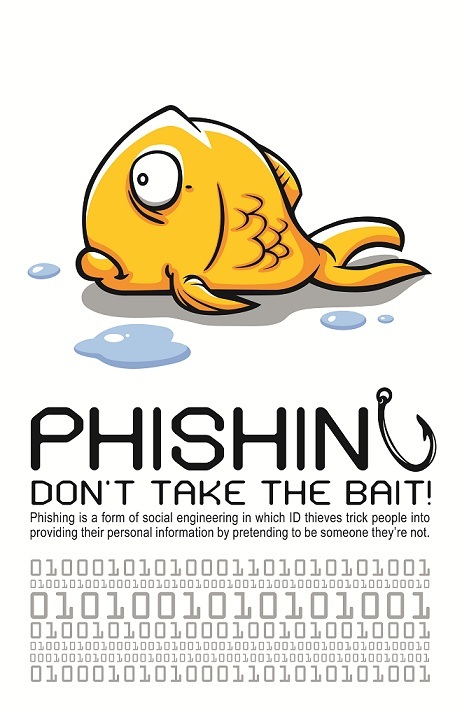 We have instructed all users to turn off the machine immediately and call us.” Training users to respond forcefully like this ensure that phishing attempts quickly fail and the possibility of malware infection is minimized. If your PC is unmanaged (e.g. your home computer) or for some reason you aren’t able to contact your helpdesk, killing your browser and rebooting your computer may not be enough. “I’d recommend a System Restore when you accidentally click on a bad browser link,” says another colleague named Mark, who owns a company in San Diego that provides custom software and IT services for small businesses. “Besides your home page, you don’t know what else it might have changed on your system or what has been downloaded and installed.” After doing this you should also run a full scan for malware using your antimalware program, or preferably using an offline malware scanner like Windows Defender Offline. At this point, it’s wise to review what happened, that is, how you fell for the scam. Taking a minute to do this will help reinforce the training you received as an end user by your organization’s human resources department so that you will be less likely to fall for similar scams in the future. Make sure you also report the incident to your HR department even though the helpdesk has fixed the problem you were experiencing on your computer. And it’s also a good idea also to report the scam you fell prey to by using the technical support scam page on the Microsoft website. 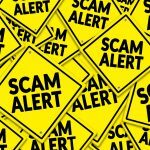 This will help Microsoft put a stop to the scam by assisting them with the information they can share with law enforcement agencies as they investigate such scams. It is true that online computer support services are good and online computer support scams are on the rise but not all the companies are involved in them. Some researchers are saying that not all the online support companies are fake but it is all about the customers to choose the right one. Thanks for your comment. Any suggestions on how one might choose the right company for your tech support services?